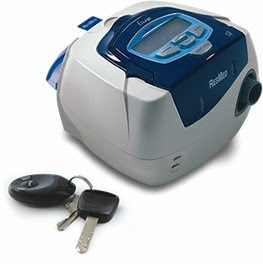 A few weeks ago, I was reminded of the small miracle presented by Jim's CPAP. Over a decade ago, a few years into our marriage, I thought I was going to lose my mind or have to move into a separate bedroom. Jim snored the weird cadence of a malfunctioning buzz saw. While most spouses might respond with a gentle nudge, I would shove him until he moved into a non-snoring position. This happened dozens of times each night. The biggest mystery was why Jim, for all his snore-generating behavior, was even less rested than me. He was disconcertingly falling asleep at stoplights and any time life paused into quiet. I was showing the confusion and insanity of sleep deprivation and Jim seemed to have narcolepsy. My dad noticed Jim falling asleep all the time and suggested Jim go for a sleep study. Our physician decided the same thing when Jim told him how he hadn't been sleeping well for a very long time. The test results showed that Jim's constant morning headaches, dry mouth, snoring, and agonizingly poor sleep were all due to the fact he quit breathing regularly throughout the night. The constant struggle for air kept him from ever falling into a deep sleep while short periods of oxygen deprivation put him at higher risk for heart attack and stroke. It turns out that, shoving injuries were some of the smallest threats he faced. Jim was placed on CPAP, and after finding the right mask, we both started getting real sleep. Jim said the first day after using his CPAP felt like recovering from a long illness. Since Jim's diagnosis many members of his family have also been diagnosed with sleep apnea. It turns out their nose and throat structure makes them more susceptible to sleep apnea. Very recently, Jim noticed a twenty-something friend falling asleep at a stoplight. After talking to Jim our friend was also diagnosed with apnea. I don't think many people in our generation are aware of sleep apnea which is scary considering how it can contribute to heart attacks and strokes. If your partner's snoring or gasping seems atypical, you should probably read Mayo Clinic's guide to sleep apnea (actual medical information written by professionals). Jim is happy to reply to comments or email. He is an apnea awareness evangelist since his diagnosis and treatment dramatically improved the quality of his life. One of the great pleasures of visiting my grandparents' house was reading the old Nancy Drew books kept on a guest room shelf. Among her many virtues, the girl detective could really sport a headband. I, on the other hand, either got crushing headaches or watched them slowly migrate to the back of my head throughout the day. Any attempt to change the band's backwards progression resulted in a faux bouffant that was anything but stylish (even in the 80s). In college, I tried using scarves as headbands, but they too would slink off in the course of a few hours. I gave up on headbands entirely, keeping one of each style in case I should ever foolishly convince myself that they would work. When Goody offered to send some of their ColourCollection skinny headwraps, I was pretty sure that they would be another style to stick in my expanding box of rejects. The package of six came hours before game night, so I offered one to each of my five guests. One mom immediately declared the headband too tight and handed it back to me within minutes. Everyone else was pleased to try them. Like the aforementioned friend, I initially found the headband snug. This isn't a surprise as my head is about an inch larger than most large women's hats. As the evening progressed, the accessory relaxed enough to accomodate, but not so much that it abandoned its duties. It was atually comfortable, but I suspected that pliability was a harbinger of future stretching. Over two months later, I realize those fears were unnecessary. I wear one of the headbands daily, and it when it is not in my hair, I usually have it looped three times around my wrist. My mom is happy as it is one of the first times she's not perpetually asking me to pull my hair out of my face. I'm happy because my hair doesn't blind me in strong wind or whenever I look down. The skinny headwrap also attracts compliments about my hair (to which I am rather unaccustomed); many people (included Jim) have complimented my recent haircut (last haircut was Dec. 2008) and my new style. The headbands are inexpensive (6 for $3.99), so I don't worry if I lose one under the bed or in the car. Their elastic keeps them in place, so don't require much primping or attention. One friend reports that her petite 8-year-old daughter often wears the headband. This friend's very gorgeous naturally curly hair pushes the headband forward on her, but she really likes using it looped as a ponytail holder. Most of my friends still wear their headbands regularly. As for me, I'm planning on getting a new pack (in brunette) soon. Fine print: Baby Toolkit received six promotional headbands ($4 value) from Goody. We have no undisclosed relationship with or financial interest in Goody Products, Inc.. We're not hair professionals (stop laughing, already); we're just geek parents with opinions.